Forrest Reid's novel The Spring Song was published in October 1916 and so this month marks its centenary. Reid's delicate, subtle work in the fantastic has often been overlooked. His prose shares some of the dreamlike qualities of the stories of his friend Walter de la Mare, and he also learned from Henry James a certain finesse in expression, without quite so much of the hesitancies and qualifications which that master often introduced. The sinister element in this book has aspects in common with James' The Turn of the Screw, but it balances the atmosphere of dread with a fervent delight in the natural world and in companionship. The following comments are from my introduction to the recent Valancourt edition of The Spring Song. 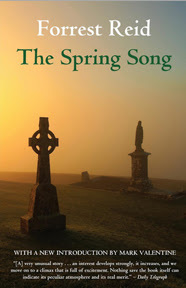 Set in the Ballinderry district of County Antrim, where Reid holidayed as a boy, The Spring Song portrays a young family on a long visit to their grandfather and aunt: one of them, the boy, Grif Weston feels wakened to the real meaning of Spring, and seems to hear the pipes of Pan. Supernatural incidents and other adventures follow and the book moves more definitely into the realm of the unseen. Yet there are also fine evocations of landscape, and well-observed portrayals of character, especially those of the children. Reid achieves an exceptional sympathy with the intensity and individuality of the child’s view of the world. While Grif shares some typical traits and attitudes with his more practical, prosaic siblings, he also has qualities that make him seem different, just as Reid himself evidently felt different in his own family. The boy has a keen affinity with trees and nature, and a sensitivity to an unseen world, so that we understand him to be an instinctive pagan, and a dreamer of other domains: he several times seems to be on the verge of encountering another, rarer world. There is little doubt that Reid expresses through Grif his own emotions and experiences in childhood and youth, and the convictions he sustained as an adult. The book is significant in Reid’s work as the harbinger of his most fully-achieved creation, the Tom Barber trilogy. Grif is in many ways a first, slightly more tentative, version of Tom. But already here Reid shows his ability to depict boyhood in a fully-realised way, respecting both the intense inner life of his character and the simple physical excitement found in holidays, games, pets, playmates and adventure. The character of Palmer Dorset, an older boy, resourceful and alert, and something of an amateur detective and philosopher, provides a charming counterpoint to Grif’s dreamier qualities, and some of his good sense and intelligence probably also contributed to Reid’s development of Tom. Reid later gave Palmer Dorset his own novel, Pirates of the Spring (1919), about the dawning of friendship, and shared struggles, among four schoolboys.